Zapier is an online application that works as a trigger – action system: when a pre-established event (trigger) happens in a specific application, an action (also pre-established) is triggered in response. Zapier enables users to connect hundreds of apps with each other without requiring technical expertise/coding knowledge. In order to trigger an action in App B, there must be some 'activity' in Pipe A. In this integration's case, the trigger is "Card moved" in Pipefy and the action is ‘Update row’ in Google Sheets. How to set this integration up? First and foremost, to begin creating this integration you must log in into your Zapier account (if you don't have an account yet. After you do so, click the orange button that says 'Make a Zap'. You begin creating the Zap by selecting the trigger app. In this case, Pipefy is the trigger. 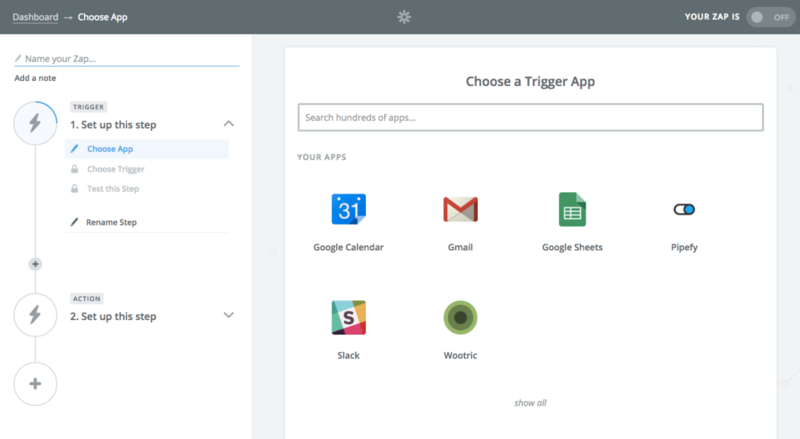 After selecting Pipefy as the trigger app, you'll choose the activity that'll trigger the integration. In this case you should select ‘Card Moved’. Even though the actual trigger event would be ‘Card Edited’, we don’t support this specific trigger in Zapier yet. This means that before you move the card to the selected phase, you should make sure the information in the card is edited. The spreadsheet row will then be updated based on the most recent changes made to the card. Once you've selected the trigger click ‘Save + Continue’ to move on to the next step. The next step will ask you to add/select your Pipefy account. 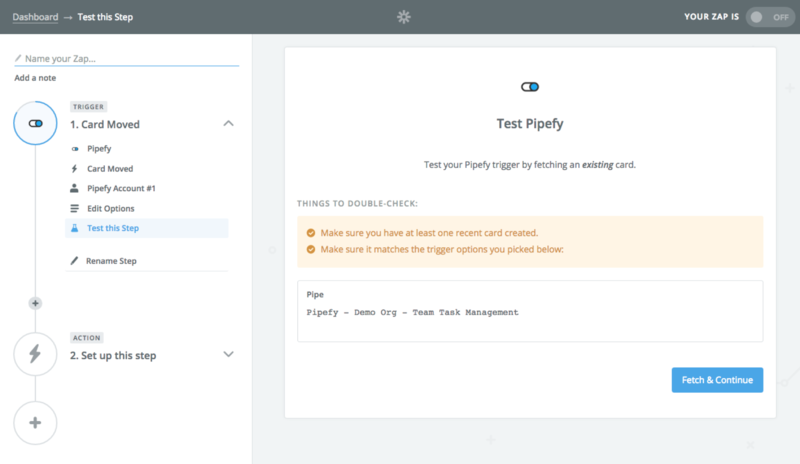 If you haven’t set up a Pipefy account yet, you can click here for instructions on how to do it. I had already added my account to Zapier, so I simply had to select it, and click ‘Save + Continue’ to enter my account. Select the pipe in which the cards will be updated. A dropdown menu (in the format ‘company name – pipe name – pipe ID’) will be displayed. I selected my 'Team Task Management' pipe. Click ‘Continue’ right after you've selected the correct pipe. If your test was successful, you’ll get a notification saying so. 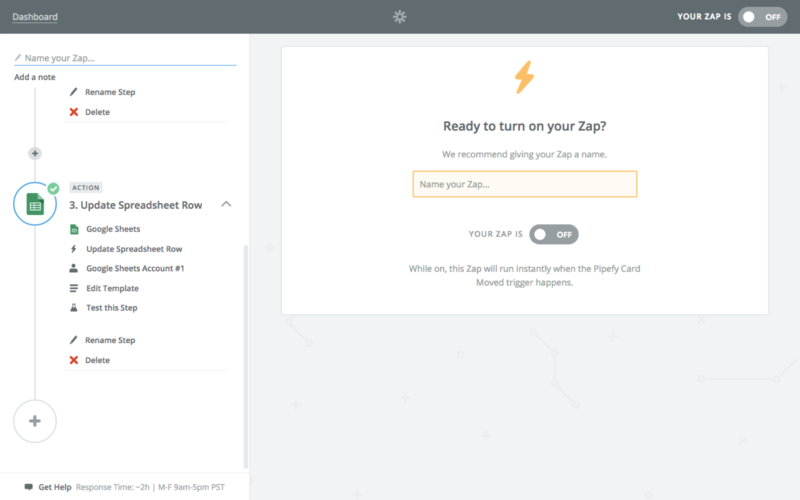 Zapier gives you the option of viewing the information from the card they've used to run the test (and will also use as a sample for setting up the rest of your Zap). If you don’t want to see the card's information, click continue to move on to the next step. Once you're done setting um the trigger you'll move on to the action. The first step is selecting the action app, which is the app where we want something to happen in. Just as you did with the trigger, after you select the action app you'll need to select the action you want to happen and save to move on with the setting up process. 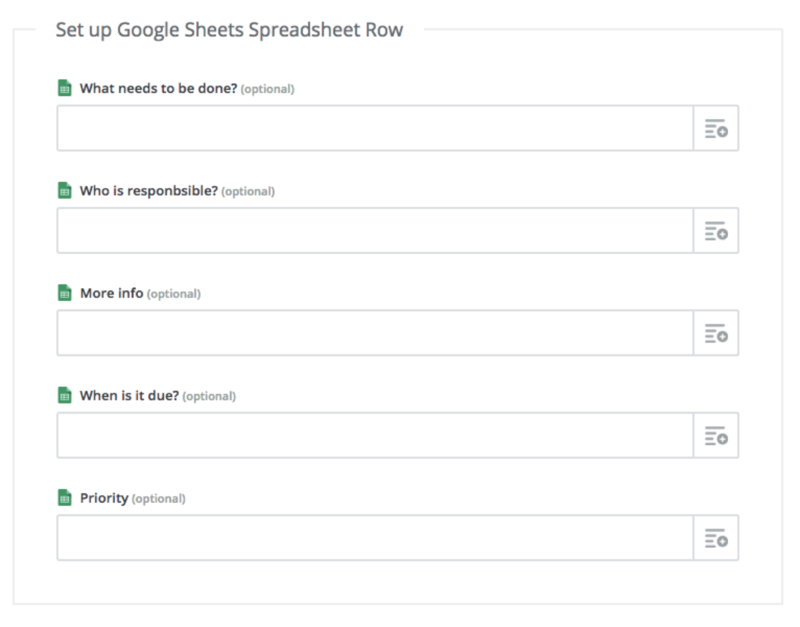 Select the "update spreadsheet row" action. 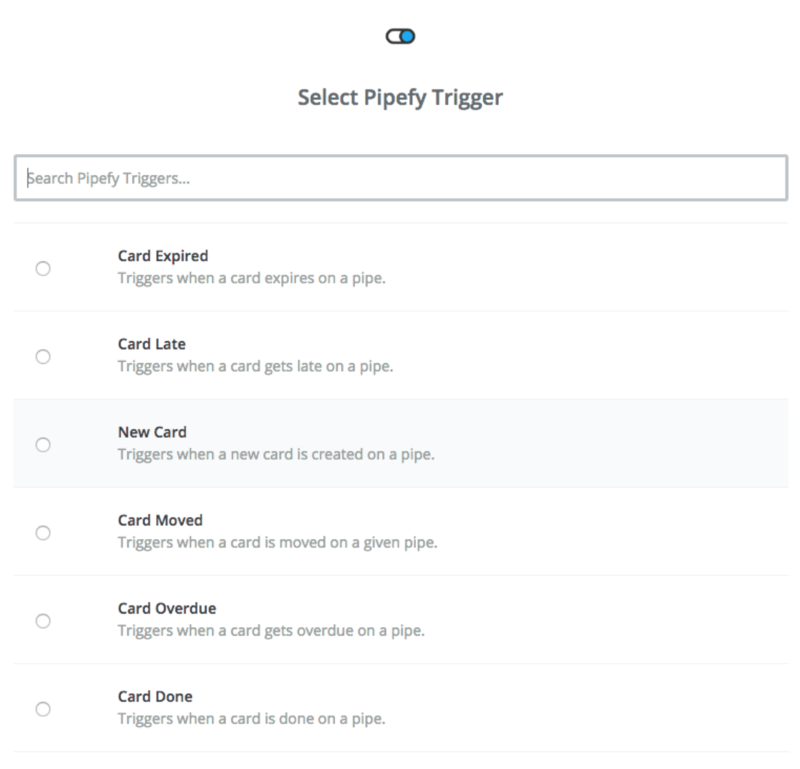 This action states that, whenever a card is moved in Pipefy (trigger), an existing spreadsheet row will be updated. Please note that, in order to actually update rows you'll actually need to have rows to update. 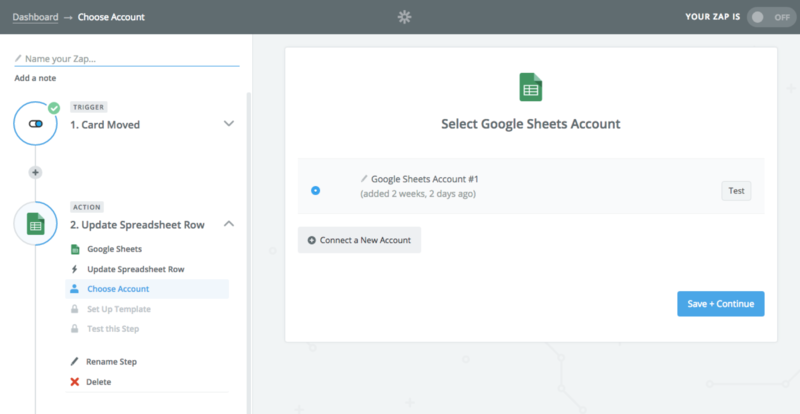 As you did with your Pipefy account, in this step you'll need to add a Google Account (if you haven't set up an account yet) or choose from the existing previously set up accounts. I had already added my account so all I had to do was select the account then click on "Save + continue". 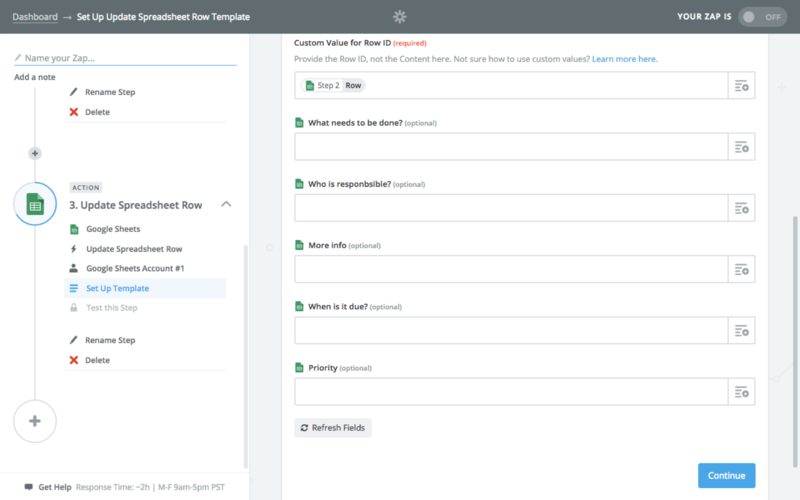 If you haven't added an account yet, click on "Connect a New Account" to connect your Google Account to Zapier. 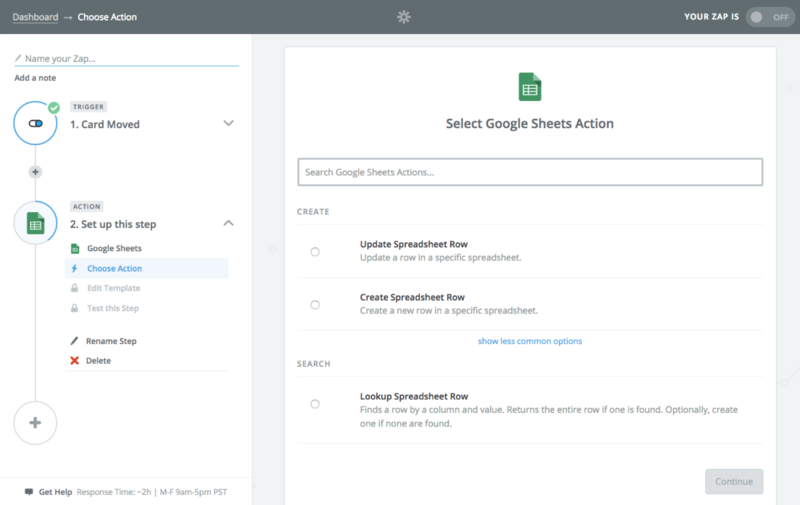 The first couple of things you need to do is select a spreadsheet from your Google account and a worksheet in this spreadsheet. This is a very important step in setting up this integration! You should select the ‘Add search step’ option to your integration. This option helps ensure that the correct row is searched and then updated. Unless you select and properly set up this option, our possibilities for updating rows are limited to one pre-configured row. Once you click on "add a search step", Zapier will show a warning pop-up letting you know that you'll be redirected to a second step. Click on "Ok! Add it˜ to move on to the next step. 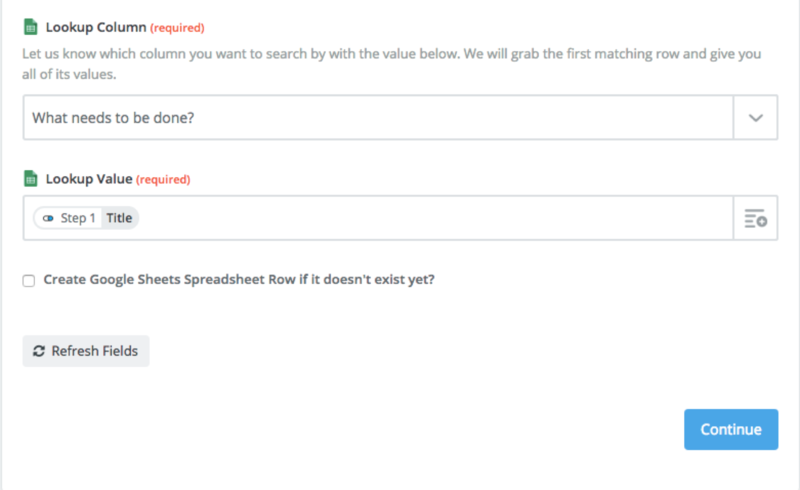 In this screen you'll need to select the spreadsheet and worksheet once more. Make sure you pick the same spreadsheet and worksheet you did before. The lookup column is the column Zapier is going to look for in a row, based in the ‘Lookup value’ you’ll also choose. I've selected my sheet's first column which will be related to the first field I fill out in the selected pipe's start form (and is also used as the card’s title). The ‘Lookup value’ is a particular cell in your ‘Lookup’ column that will enable Zapier to find the first matching row and provide you with all its information. 13. Create new row (if it doesn't exist yet) - Optional step! 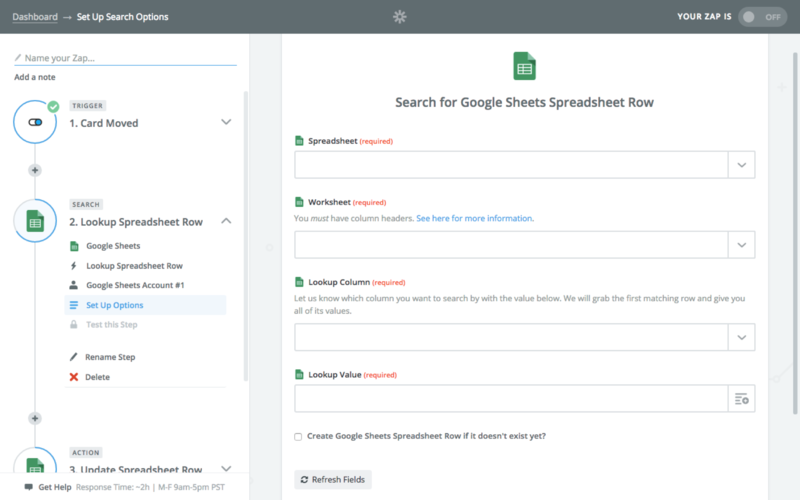 If your spreadsheet doesn't have any rows yet, check the ‘Create Google Sheets Spreadsheet Row if it doesn’t exist yet?’ box. What you'll have to do now is match the rows with the card's fields. All existing columns in the spreadsheet are displayed (in my case, all 5 columns from my spreadsheet). We'll set this up so that each of the columns matches the fields in my pipe's start form. When you click on each of the columns' menu, Zapier will display all of your pipe's fields to choose from and match them to the columns. Every time a new row is created, it will contain information you filled out in your start form. This is another testing step. 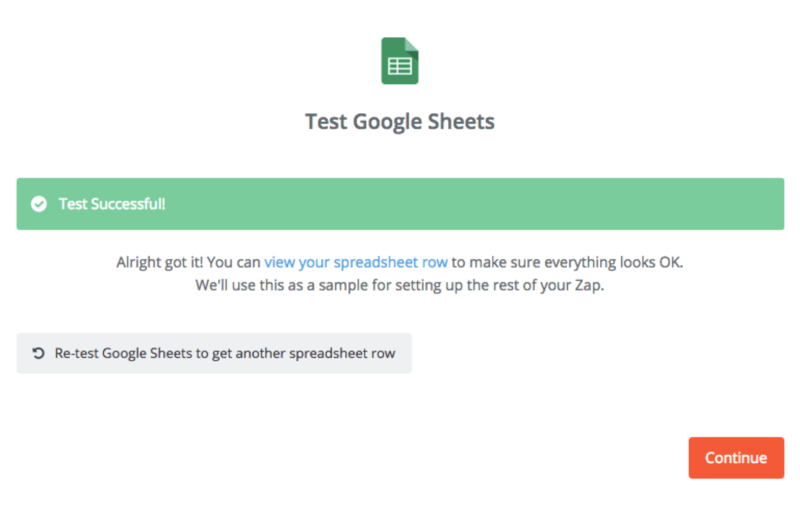 Zapier will now look for an existing spreadsheet row. Click ‘Search and Continue’ to run the test. If the test was successful, click ‘Continue’ to move on. Move back to where we left the ‘Update Spreadsheet Row’ step, which was the part in which we were setting up the template. You’ll see that on ‘Custom Value for Row ID’, Zapier automatically filled out step 2, meaning that we’re searching for an existing row. Begin editing the rest of the template. To do so you'll have to match the columns spreadsheets to the fields from your pipe. Once you’re done, click on ‘Continue’. If the last test was successful, you can clickn on ‘Finish’ and turn your zap on. From then on, every time you edit a card and then move it, Zapier will look up for an existing spreadsheet row and edit it based on the most recent information on your card. Ps. Don't forget to turn the Zap on! If you forget this step, your Zap will be saved as a draft and won't be active!